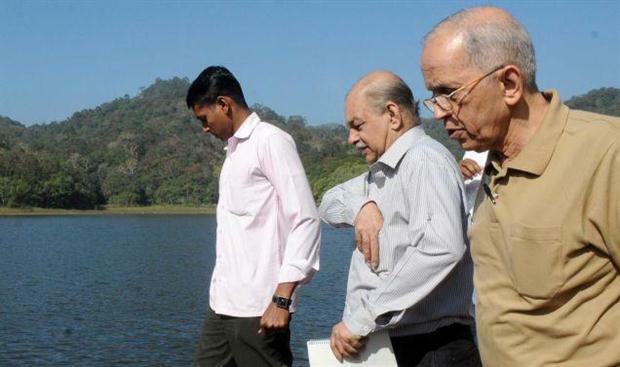 Members of the Supreme Court-appointed Empowered Committee on Mullaperiyar dam started for the inspection of the dam from the boat landing station at Thekkady near Kumily on Saturday around 9.45 a.m.
C.D. Thatte and D.K. Mehta, the technical members of the Committee, are accompanied by officials from Kerala and Tamil Nadu. A boat carrying equipment and helpers needed for the inspection were already left for the dam before of the departure of the panel members. A large media professionals from both the States was present at the boat landing station. Police had a tough time implementing the direction to stop the media from taking visuals of the team. Instuctions were given in advance that politicians and media should not be allowed throughout their visit. Complaints generated as the Tamil Nadu media professionals tried to go with the panel members for inspection. They sat on the boat which was arranged for EC members. Media Professionals from Kerala questioned this and the Police forcefully brought TN media people out of the boat. 0 Response to "Mullaperiyar: Supreme Court EC starts dam Inspection"